Still, despite the lack of these important communication components, there’s another, more important, reason why Aristotle’s Model of Communication often fails. To best grasp the reason for this failure – and how to either avoid it or take advantage of it – you need to understand why this model has been both popular and effective. Ironically, while ascribed to Aristotle, “Aristotle’s” Model of Communication is said to have been most fully developed by Roman educator Marcus Fabius Quintilianus (ca. 35-100 AD). Towards the end of his life, Quintilianus (a.k.a. Quintilian) wrote Institutio Oratoria, a summation of his teachings. 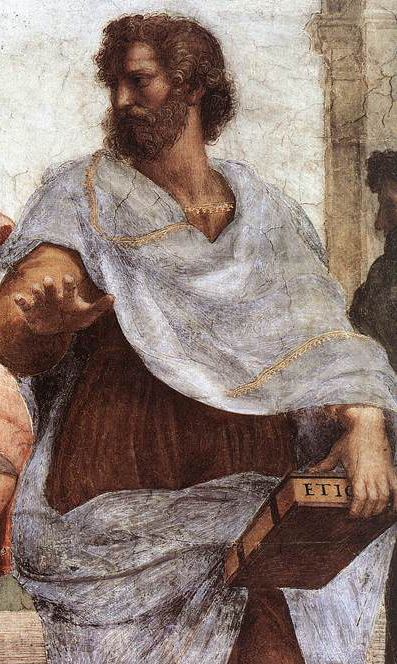 In it he broke down Aristotle’s Model of Communication into a linear progression of five parts: Speaker, Speech, Occasion, Audience, and Effect. American political scientist Harold D. Lasswell modernized these elements. You may be more familiar with Lasswell’s five questions (structured in the same linear progression to correspond with Qunitilianus). Who? Says what? In what channel? To whom? With what effect? Do these questions sound familiar? Did you remember using them when your teacher first gave you an assignment to make a presentation in class? Says what? This is the speech. What’s being said. Here we’re concerned about the content. While Aristotle’s Model of Communication doesn’t directly include the usual rhetorical tools, this would be the step where you’d use them. Going back to our example, your words will prove to your audience how their lives would become much more pleasant if they buy your widgets. How you say this, though, will depend on the answer to your next question (and the one after that). In what channel? In ancient times, this was referred to as the occasion – the event and physical location where the speaker intended to give the speech. In modern times, this refers to the actual medium. Do you intend to make this a presentation in front of a live studio audience? Maybe you want to write it, or make a podcast, or produce a video. The channel you choose will impact how you construct your speech. For example, if you choose print media, you’ll want to show a picture of a smiling person embracing your widget. If you choose video, you’ll want to show a clip of a smiling person using your widget. To whom? This is the audience. Your intended audience will determine what you say and the channel you use to say it. In our example, let’s say your widget can be used by young and old alike. For an older audience, you’ll want to use print media and the person in the picture should be an older person (sporting a broad grin). For the younger audience, you’ll want to use on-line media, preferably video showing younger people smiling as they use your widget. With what effect? This is the effect. This is the objective of your presentation. In business, it’s termed as your “call to action.” It’s what you want your audience to do. In our example, the effect, if your speech is successful will be seen as your audience buying your widgets. But we already knew that when we discussed the second question (“Says what?”). Makes sense, right? Sounds like it should work, right? There’s something profound missing from Aristotle’s Model of Communication. It can spell the difference between the audience buying those widgets and the audience falling asleep. What is it? Aristotle’s Model of Communication assumes the communication goes in only one direction: from the speaker to the audience. This violates several axioms in Aristotle’s own book of Rhetoric. Every successful salesman understands the value of developing a rapport with the customer. You can’t connect with the customer if you’re not listening to the customer. In Aristotle’s Model of Communication, the speaker is not listening to the audience. That’s usually a prescription for failure. Medium is the message, the speaker is the message, the message is the message, and the audience is the message. But if you don’t let the audience feel involved, that message may go unheeded. I said Aristotle’s Model of Communication sometimes succeeds. When might that be? You have to go back to the original source of Lasswell’s research. In an effect to help defeat Hitler, Lasswell dissected Nazi propaganda films to determine what made them effective. That led to his five questions. Now, the words “Nazi” and “propaganda” certainly have negative connotations (more so when they’re combined). Lasswell, though, was a political scientist more interested in discovering the truth (and defeating those Nazis), than in being politically correct. He knew that any successful model of communication could be used for good just as much as it could be used for evil. While Aristotle’s Model of Communication won’t work as well when communication requires interaction (think multi-player video games), it can work for advertising, where the audience isn’t accustomed to interaction.